B. Thomas (Arlington, Texas, United States) on 8 January 2019 in Animal & Insect. Blackie and Rocky loved Christmas. 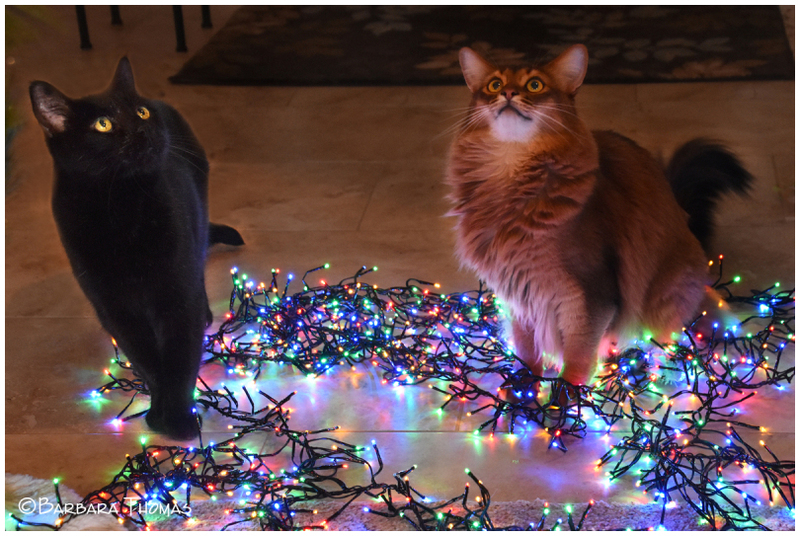 They played with everything as we took the decorations down, and then wondered where it all went. So it is boys, sad but true. But only few months and it is hera again... Best regards sent Leevi. Wow !! A beautiful image...But isn't this a bit dangerous...standing on those serial lights ? Does Blackie replace Nikon a bit in your heart? They are beautiful both Rocky and him or her ??? @By Marie: Thank you. Blackie is a sweet rescue cat but no cat will ever replace Nikon in my heart. Blackie was here long before Nikon. I don't show photos of him very often because he is over 16 years old, does not like the camera, and sleeps a lot. It is also difficult to get a well exposed image of him. Another of those lovely moments . .
Looks like they wanted Christmas to continue. Nice capture. Ha ha ha B:))) They say that a cat has nine lives !! So, don't you worry even if they get stepped on !! I love the intense looks on their faces that you've captured here!! As if you might be holding some catnip! Happy ST! Poor fellows! They'll really enjoy next Christmas. They are both gorgeous! Christmas came and went so fast! I am wondering too where it went. They look a bit forlorn but I am sure they have lots of other toys to play with ‘til next christmas.